While in Taipei, we were lucky to spend a long afternoon and evening with Ivy Chen who has been teaching cooking to expats and tourists for 17 years. We met Mrs. Chen at Shidong Market in the Shilin district in the north part of the city. Shidong is an enviable indoor market with vendors selling luscious seafood, poultry, pork, Chinese sausage, noodles, tofu, seaweed, pickles and produce. There's a full-on noodle factory at which you can take your pick from 10 different styles made that day. The tofu shop has 15 kinds of tofu with varying textures and densities, some dark, dry and marinated, some smooth and creamy, some crispy-fried or skin-thin and rolled into a bundle. There are vegetable sellers who sell produce that is rare in Taiwan like Brussels sprouts and arugula. The varieties of cabbage, mustards, edible ferns, herbs and other green leafies is overwhelming. It's the kind of market I'd give my left leg to have nearby and Mrs. Chen lives two blocks away. She goes every morning and buys fresh ingredients for herself and her students. She'd never even think of buying meat after 10 am. It's not fresh enough for her. She's a firecracker. She told us that she drove her mother nuts with cooking questions when she was a kid and that she is constantly riding her sister because she has no sense of when particular fruits and vegetables are in season. She's always giving Mrs. Chen gifts of woody breadfruits and mealy apples. We asked Mrs Chen to show us how to make steamed buns, the ubiquitous fast snack sold from hot cabinets around the island and in China. One would be hard pressed to learn how to make them from a book. While it's hard to do them really well (with succulent fillings and uniform dough that is pleasing to the tooth and the eye), the principle is pretty basic. You make a yeasted dough with white flour, water, oil and a pinch of sugar and let it rise in a warm place. You make a filling of your choice. In our case, we used ground pork, scallion and ginger water, rice wine, salt, black pepper, sesame oil and chopped scallion. Scallion and ginger water is a simple and brilliant flavoring. You just take green onions and ginger and throw them in a blender with water to make a thin, bright green sauce. You punch down your dough and divide it into balls. Then roll each ball out so that it is thinner at the edges than in the center. Spoon on your filling and then comes the tough part: pinching, stretching and folding the dough around the filling. 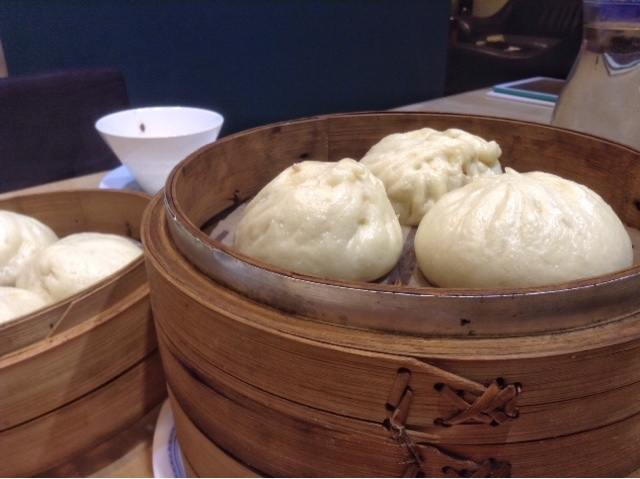 It should be pretty easy to tell from the photo below which of the three buns was made by Mrs. Chen. We need some serious practice. Stack your baskets on a pot filled with water, crank up the fire and the kitchen fills with steam scented with the hot bamboo and the cooking buns.